Sergeant Pilot Orchard joined No.65 Squadron on 20th April 1940, having been officially promoted on 3rd April previously. Over the years there has been considerable discussion and criticism of the RAF for its system whereby a pilot could be either a Commissioned or a non-Commissioned Officer, but those who were involved generally feel that no real problems were caused. Regardless of rank, a fighter pilot was a member of a team, and as such respected his colleagues as much for their ability as their rank. As Jeffrey Quill has said, in a Fighter Squadron "...there was a great deal of comradeship and informality amongst the pilots and the NCO pilots were highly respected by all ranks and some of them achieved great things". Harold was, in fact, offered a commission, but turned it down because he felt that as an officer had to provide uniform and so on for himself, he was better off as a sergeant! 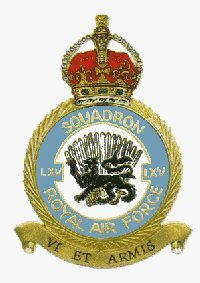 65 Squadron had been reformed at Hornchurch, where it was still based, on 10th July 1934. In 1936 it was equipped with Demon fighters, and by 1938 these had been replaced with Gloucester Gladiators. However, by the outbreak of the War it was one of nine squadrons operating Spitfires. When Harold arrived, the flight at Hornchurch consisted of 54, 65 and 74 Squadrons, all Spitfire units. Over the next few months several changes were to take place as units were moved around during the Battle of Britain. Hornchurch was a sector station in Fighter Command's No.11 Group, which was to be the front line of defence in the forthcoming battle. It was a comparatively large airfield, although it had no hard runways at the time. It was well-equipped with repair and recovery facilities, and held large stocks of fuel (70,000gallons) and ammunition (1,500,000 rounds). By day, pilots could use the three chimneys of Ford's factory as a landmark, although they were not so fortunate at night. Full accommodation was provided for the personnel, and there was a bus stop 200 yards from the airfield entrance. When Harold joined 65 Squadron, the war had not reached a critical stage, and so Flying Training continued along the lines laid down before the war. This envisaged that a pilot should have at least 40 hours experience on operational aircraft with a unit on active service. His Log Book reflects this, as he spent the first two weeks in his new posting in a Miles Magister, mainly familiarising himself with the area surrounding Hornchurch. Many RAF squadrons during the war were equipped with a number of training aircraft, as well as their combat machines. The Magister was one such plane. It was, in essence, a monoplane version of the Tiger Moth, although it had not actually been developed as such. It had the same engine, a Gypsy Major I, and was not dissimilar in size, having a wing span of 33ft 10ins and a length of 24ft 7ins. Also like the Tiger Moth, the Magister could carry two people, one behind the other in open cockpits. It was not a particularly fast aircraft, having a cruising speed of 110 mph. Besides using the planes for training, squadrons also used them as transport, and Harold's log book reflects this. For instance, on 19th June he took Sqn/Ldr Darley to Debden; on 21st June L/Ac Tucker was carried to Biggin Hill and Manston; and on 5th July Cpl Watson was taken on a 30 minute flight to gain 'air experience'. 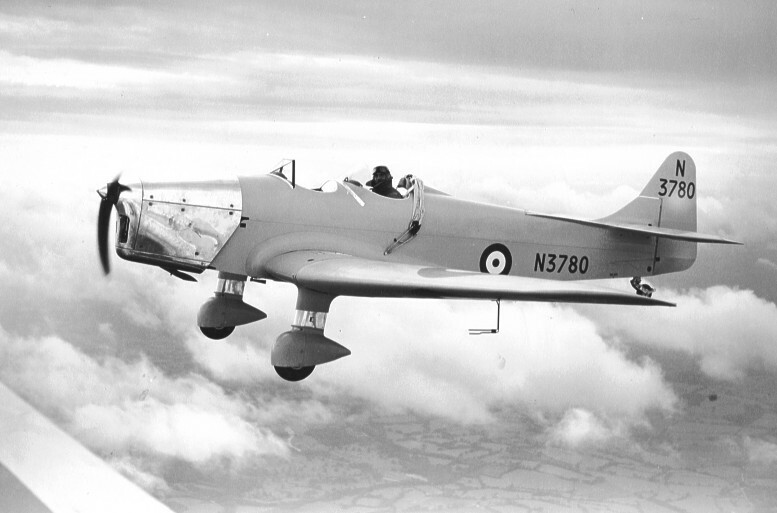 In all, Harold spent some 18 hours flying Magisters, much of the time in P2943. At the same time as he was becoming accustomed to the Magister, Harold made his one and only flight in a Miles Master, on 2nd May. The flight, lasting 40 minutes, was logged as 'experience of new type', although Harold never flew in one again. The Master was an advanced trainer, much faster than the Magister at around 240mph, although more or less the same size. It was powered by a single Bristol Mercury engine, similar to those fitted to the Blenheim bombers. The next day, 3rd May 1940, saw Harold experiencing another new type, when at last he found himself at the controls of Spitfire Mk.1 No.K9909. After an hour in this particular machine, he spent a further hour in L1094. Over the next seven months he would spend a total of 180 hours flying Spitfires. The history of the Spitfire is well known, of how it was designed by R.J.Mitchell as a result of his work with Shneider Trophy winning seaplanes. 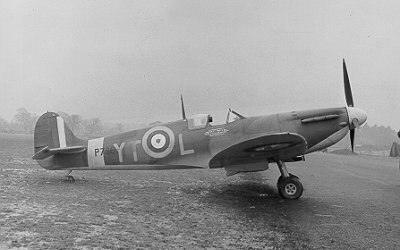 The Spitfire was first produced in 1936, entering service with the RAF's 19(F) Squadron at Duxford, Cambridgeshire, in June 1938. It had a wing-span of 36ft 4ins, and a length of 29ft 11ins. A Rolls-Royce 'Merlin' engine produced 880hp. Mark 1 versions could climb at about 2,500 feet a minute, taking just over nine minutes to climb to 20,000ft, and it could operate at a maximum height of 34,000ft. The Mark I Spitfire's maximum speed was 362mph in level flight at 19,000ft, and it could reach 450mph in a dive. In level flight it could outrun its main rival, the Messerschmidt 109, although the German fighters could outclimb and outdive the Spitfire. The Spitfire's main advantage in combat was, however, the fact that it was infinitely more manoeuverable. It could turn in a much tighter circle, which meant that a Spitfire could come around behind a Me109 when both planes were turning. Armament on the early Spitfires consisted of eight .303 machine guns, four in each wing, which fired a total of 1,300 rounds a minute. Since only 300 rounds were carried, the pilot had only about 15 seconds in which to actually fire at an enemy aircraft. This, then, was the aircraft which Harold had to become familiar with in the next few weeks, and at the same time he became more and more acquainted with the area. On 27th May he landed for the first time at Manston, the station to which he had been sent for some of his initial technical training four years earlier. Over the next few months the flight between Hornchurch and Manston was to become familiar to all the squadron's pilots. A change in routine occurred on 24th May, when the Log Book records that Harold ferried Spitfire K9915 to Hamble, near Southampton. In the meantime, the war had ceased to be a quiet affair, and matters on the Continent were reaching a climax. In early April the Germans had invaded Denmark and Norway. As a result, Chamberlain resigned and on 10th May Churchill became Britain's Prime Minister. On the same day the German offensive was launched against Holland and Belgium, culminating in the evacuation from Dunkirk, between 27th May and 4th June. Finally, the Nazis entered Paris on 14th June. During this period the French Government continually called on Britain to send more and more aircraft to France. Air Chief Marshal Dowding realised that there was a limit below which he could not allow his fighter strength to fall if he were to defend Britain, and he eventually persuaded Churchill that 25 squadrons must remain untouched. In particular he did not want to commit his valuable Spitfire squadrons. Churchill has recorded that on 16th May 1940, whilst he was in Paris, he ordered the last ten squadrons to France, leaving Dowding with his absolute minimum strength in Britain. As it was equipped with Spitfires, 65 was, therefore, one of very few RAF squadrons not to serve in France, as even some of the last 25 had been there at one time or other. 65 Squadron, taken at Kirton-in-Lindsey. Harold Orchard is probably back row, extreme right. On 29th May the Squadron moved to Kirton-in-Lindsey for a few days gunnery practice, although the weather was unkind, and some practices were a wash-out. The squadron was back at Hornchurch on 5th June. More practices continued, no doubt one of them being 'Squadron Take-offs'. This consisted of forming up on the grass airfield and taking off in four groups with three aircraft in each group, in Vic formation. In this way the whole squadron became airborne almost simultaneously, something which could not be done on a hard runway. Events caught up with Harold on 9th June, when the Log Book entries divert from training to the word 'Operations'. By chance, Harold had completed 40 hours and 20 minutes advanced training with an operational squadron. Geographically Manston was now the one of the closest airfields to the enemy. It was what was known as a forward aerodrome, rather than a squadron base, and all RAF Commands used it as a refuelling and rearming position. Consequently, its storage of pyrotechnics in particular was greater than Hornchurch's - 5 million rounds of small-arms ammunition and 40 tons of bombs. Like Hornchurch, the landing area was grass, and there were prominent landmarks to assist pilots, in this case a steeple and a laundry chimney. At night there were aerial lighthouses. There were fewer repair facilities then on a sector station, but accommodation for personnel was provided. A bus service ran near the airfield. Throughout the rest of June 65 Squadron's duties alternated between combat practice, mounting offensive patrols, and reconnaissance flights over Northern France. The first of these flights took place just after dawn on 18th June, when several airfields were checked, although German aircraft were only seen on one. Several such patrols were mounted, and the Operations Record at Hornchurch notes that if the Squadron continued its somewhat daring invasion of enemy airspace it was likely to be caught by them returning across the Channel. The Luftwaffe activity in the Channel increased as it took over airfields in Northern France, and units of the RAF would be detailed to protect convoys moving through the Channel. At the same time, the RAF Defence system was being tried out, using the extensive Radar network which had been established around the Eastern and Southern coast. On the 11th June, for instance, 65 Squadron was ordered to investigate an 'X' ('of unknown derivation') raid , but it turned out to be Blenheim bombers returning from the continent. Harold, meanwhile, was continuing with his routine of familiarisation with both the Spitfire and the Hornchurch sector, and so was not involved in much of this activity, although he did take part in some convoy protection patrols. One event he did not miss, however, occurred on 27th June. On that day, Hornchurch was honoured with a visit from King George VI. Accompanied by the Commander in Chief of Fighter Command, Air Chief Marshal Sir Hugh Dowding, and various other high ranking Officers, the King was taken to the area between 65 and 54 Squadrons' hangars, where all available personnel were drawn up around three sides of a square. Here the King presented medals to a number of pilots. After the ceremony the Station Commander accompanied His Majesty around the aerodrome and he met the pilots at the dispersal huts. Harold's log book shows that he was detailed to patrol that day, and one wonders what 'engine trouble' forced him to return early! By now the war had reached a critical stage, and the Luftwaffe were building up their strength ready for the intended destruction of the Royal Air Force. Just before the 'official' opening of the Battle, Harold was mentioned for the first time in the Squadron Operations Record in anything other than a routine way when it was recorded that on 2nd July he carried out co-operational exercises with the Thames Estuary gun defences.